I’ve been doing a lot of thinking about grains lately. We all know that, if you’re going to have them, whole grains are better than their overly processed relatives. And, for some reason, the weirder and more obscure the grain, the better I feel about eating it (hence the kamut, farro, barley, wheat berry (above) concoctions of the past week). 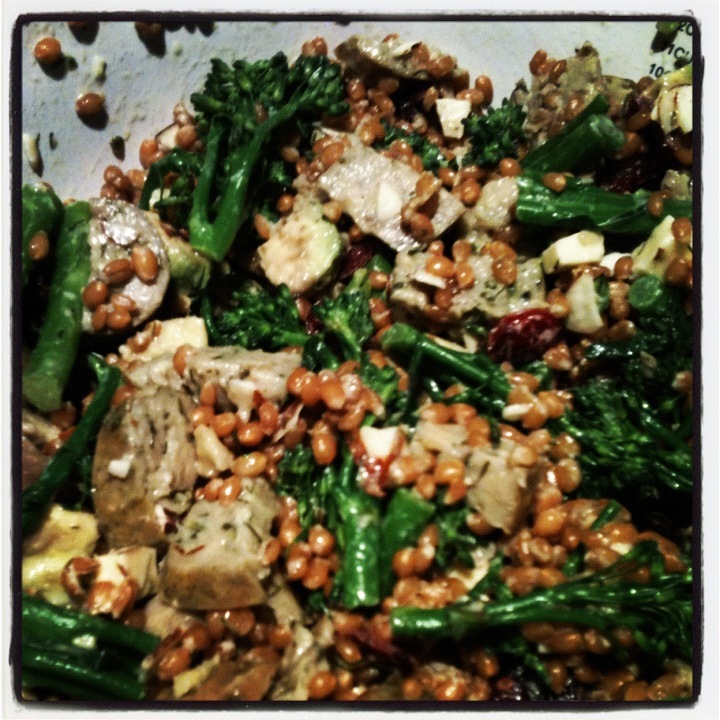 (Check out a cool blog series about grains here. But now I’m wondering if I should be eating them at all. You see, I downloaded the book Wheat Belly on my Kindle a few nights ago and am very intrigued by the author and cardiologist’s premise that modern wheat is what’s making people fat. So far, it may be in the same category as cow’s milk for me — it affects some people more than others. But I am researching and hope to report back to you here. I sort of get in this research mode in the winter months when eating healthfully becomes, well, difficult. I can’t just swing by my farmers market each Wednesday and fill up on fresh vegetables, building a menu around them and some grass-fed meats. No, winter makes me want oatmeal, and lots of it. Every morning, I want a warm belly full of it — and my coffee. So just in case I do end up going Paleo or Primal or Gluten-Free or any of the other buzzwords (which I don’t plan on doing), I’ve been exploring some new wheat-alternative recipes. And there are some seriously good ones out there. First, I made Domenica’s hot cereal with kamut instead of farro (yes, yes, I know, they are grains, but they are fun to say, which makes them OK) last week. The kamut had a tougher shell than farro and I think merited a little more cooking time. 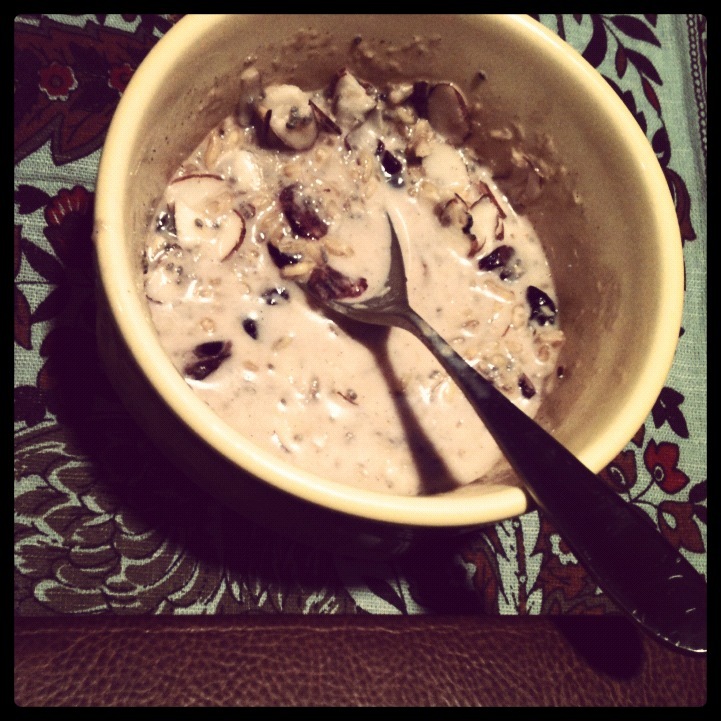 But I sort of liked the extra chewiness, along with the almonds and dried cranberries I added, and it softened when I warmed it up each morning. The vanilla bean flavor was just irresistible, calling me to open the fridge and grab a spoonful out of the bowl every time I thought of it. I used cane sugar and less of it, since I was going for a breakfast food more than a dessert (but it works as both!) Head over to American Food Roots for the recipe. This week, after brushing up on my wheat-and-grains-might-be-bad readings, I decided to experiment with some alternative hot cereal options. And, boy, did I find a winner. This coconut porridge recipe, from The Wholesome Home, hit the spot. I tried to remember to take a good picture, but I just kept eating it too fast (hence the artsy, bowl-half-full shot above). If you’re a coconut fan, the texture is just great. 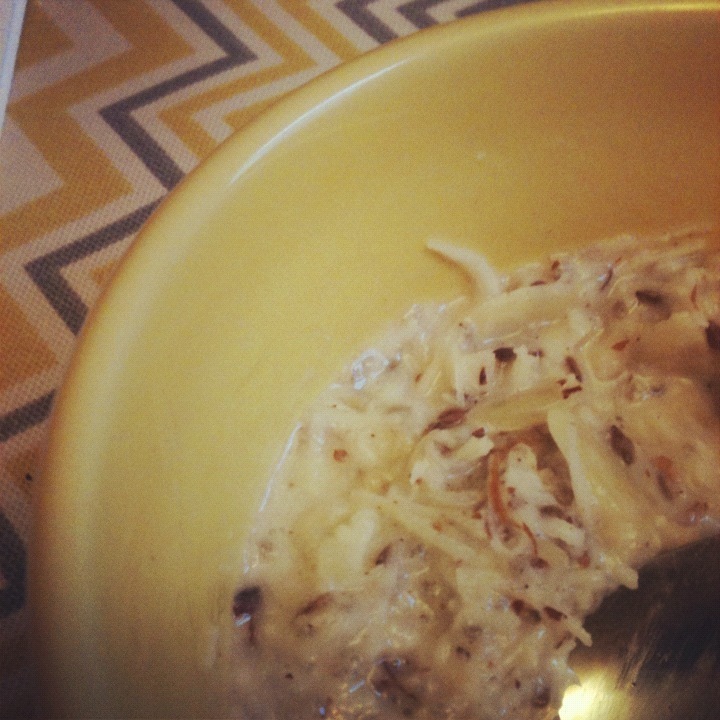 I added chia seeds, sliced almonds and flax to the mix for additional crunch. I added a little coconut flour to thicken, since I had it on hand. 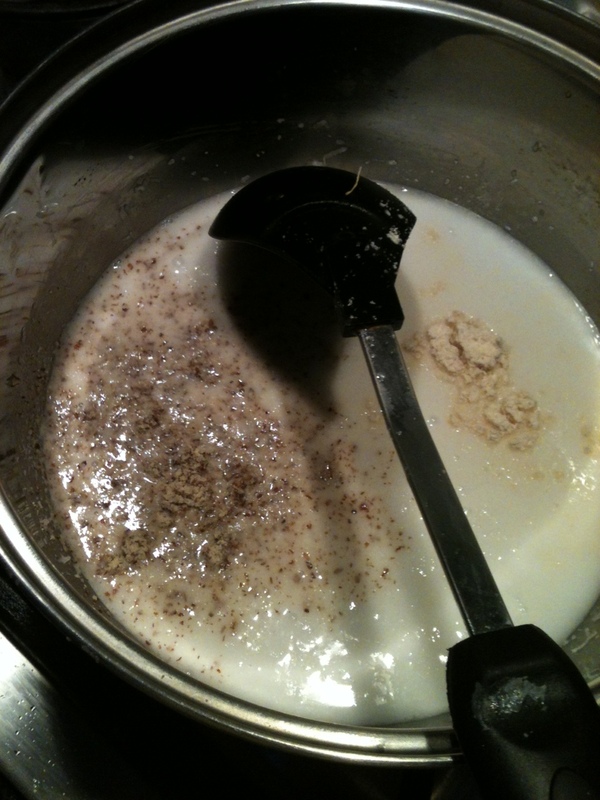 Can also add sliced almonds or other nuts, dried fruit, chia seeds, etc. And while you’re waiting for the porridge to thicken and your coffee to brew, grab your blender and make a veggie-fruit smoothie to have as a mid-morning snack. If I’m working out later in the day, I have a couple eggs with my porridge. What are your wheat-free recipes and stories? What do you think of the Wheat Belly concept?